I’ve been taking my children to Paris since they were able to appreciate a good crusty baguette (about 5 years old). I have a slew of Parisian friends so we have had the advantage of experiencing the city with locals. 1. During the summer months, the Jardin de Tuileries turns into a kids’ paradise, thanks to an amusement park filled with trampolines, marionette shows and a Ferris wheel that offers a superb view of the city. Two of the finest museums in Paris flank the park: the contemporary Musée du Jeu de Paume and the Musée de l’Orangerie, which houses Monet’s celebrated Water Lilies. 2. A visit to the Louvre is essential, and an interactive approach keeps kids entertained. Paris Muse offers Paris Muse Clues: A Family Tour for Young Treasure Hunters, a two-hour treasure hunt through the museum that sharpens detective skills through observation. housed within an ancient palace. 4. Small children will go mad for the Jardin d’acclimatation, an old fashioned amusement park in Bois de Boulogne. The outdoor space features a house of mirrors, archery range, puppet theater, playground and waffle stalls. 5. The Eiffel Tower tops everyone’s list. Here’s a tip: Don’t go to the top. 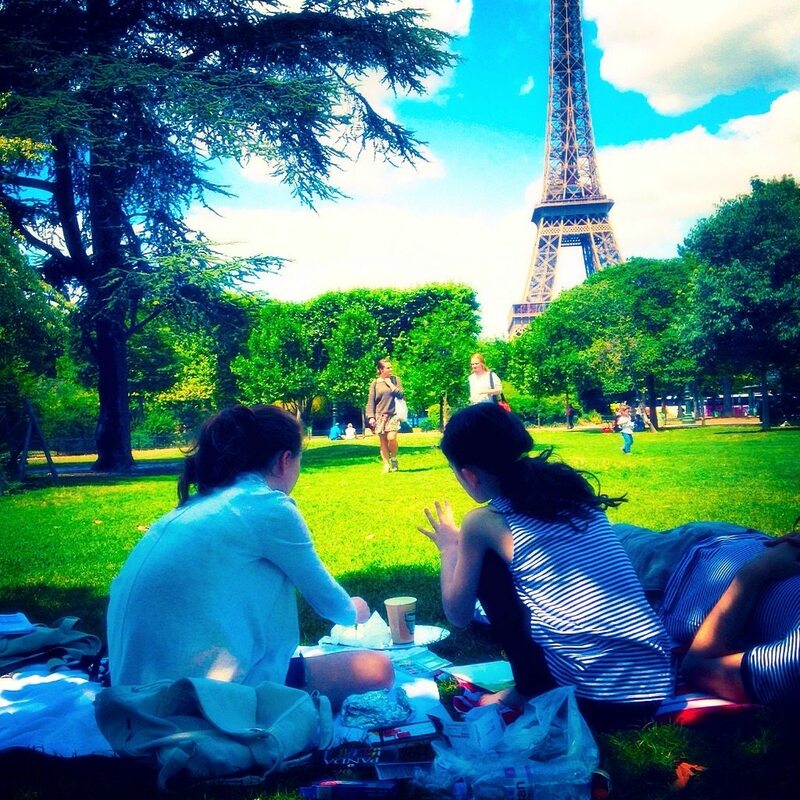 Convince your kids it’s a waste of time (it will take all day) and, instead, have a picnic at Parc du Champ de Mars. Here’s what to do: drop by La Grande Epicerie at the Bon Marche, Paris’ grand food court, to scoop up fruits, vegetables, meats and cheeses. Then, take a gander at the monument while you eat and continue on for the next activity. 6. A narrated one-hour open air “Bateaux Mouches” boat ride on the Seine is an ideal way to see the city’s iconic monuments. Or, board a water taxi and use the River Seine as your tour guide. The hop-on, hop-off Batobus makes eight stops at landmark attractions, including the Eiffel Tower and Champs Élysées. 7. Macarons are to Paris what cupcakes are to America. Don’t go to any old Laduree, Book a table at the Rue Bonaparte location where there is a gorgeous room tricked out in Chinoiserie. super chic accoutrements for the house. It’s souvenir paradise. (Check here for the schedule. 9. The city’s turn-of-the-century bohemian spirit is still vibrant in Monmarte. Take the funicular up to the Basilica of Sacre Couer, the highest point in Paris. 10. The newly revamped Ritz Hotel offers 2 hour cooking classes on Wednesdays and Saturdays for families and for children (6-15) at it’s legendary Ecole Ritz Escoffier. You do not need to be a hotel guest to enroll. 11. Fat Tire Paris has bike tours at sunset. You will be taken to a handful of landmarks-sans the crowds-stop for ice cream and end the night on a bateaux mouche to see the Eiffel Tower light show. have done Roman Paris and From Baguette to Bistro. TIP: Taxis in Paris are exorbitant. Make a game out of taking the far less expensive metro. The always-entertaining cast of characters, at the platforms- jugglers, musicians and sketch artists- add to the city’s enchantment.